Some people are shy. Some people get scared easily. Some don’t like to be touched. Some people are really friendly (you know, the ones who always want hug everyone!) and some people don’t always get along. We all have comfortable and uncomfortable social interactions and the same goes for dogs. Every dog has their own unique personality and their own way of dealing with social interactions. Some dogs will stand quietly and can appreciate when you pat them, others may back away from the situation, some will try to jump as an outlet for anxious energy, and there are always the dogs who just can’t get enough of the attention. My dog, Lola, is one of those who just can’t get enough of the attention. Whenever she comes along to a WHS In Your School presentation, she wants to say hello to everyone and sniff everything! She often times will roll on her back expecting to get belly rubs and won’t hesitate to give kisses to those who want them. Anyone who has met Lola knows what a gentle and patient dog she is. Being gentle, patient, and well-trained makes Lola perfect to be a Winnipeg Humane Society ambassador dog. Ambassador dogs (and of course, their handlers) visit schools and community groups with our Educators and interact with the students during their visit. Having a dog visit during a presentation is a fantastic way to engage students. It also allows us the opportunity to demonstrate how to safely interact with a dog. Before any of our ambassador dogs can visit schools, community groups, or day camps they must have a behaviour assessment with the WHS Behaviour Team. These assessments check the dog’s temperament and reactiveness in different situations. Our Behaviour Team will typically handle the dogs tails, paws, and ears to see how the dog reacts. The Team will also simulate a classroom setting by performing a “crowd”, making lots of noise and surrounding the dog to again see how the dog will react. After the behaviour assessment, if the dog is approved, both the dog and the handler can then come along to schools for presentations, visit our Kid Camps, and even attend community events. It’s a wonderful opportunity to educate our community about dogs, their behaviour, body language, how to interact with dogs, and it gives children the chance to have a memorable learning experience. 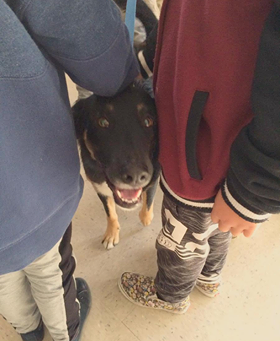 If you believe that your dog could be an ambassador dog for the Winnipeg Humane Society or if you would like an ambassador dog to visit your classroom, contact our Education Department at 204-982-2046 or email education@winnipeghumanesociety.ca.